Today, People for the Ethical Treatment of Animals (PETA) signed onto an open letter condemning a company that might surprise readers: Whole Foods Market. Ten years ago, PETA joined other groups in penning a very different open letter to Whole Foods CEO John Mackey, praising the company's efforts at reducing cruelty to the animals who end up on the dinner table. But now PETA joins over a dozen animal rights organizations in asking where things went wrong and condemning the supermarket chain for passing off as "humane" dairy foods and meats that are only marginally less cruel, if at all. In short, we're accusing Whole Foods of consumer fraud. People who shop for "humane" meat and dairy are duped into buying a lie, thinking that they are doing something good when, in fact, they're actively contributing to the suffering, pain, trauma and fear inflicted on animals considered mere commodities. Shoppers are encouraged by Whole Foods to believe that all is well, when even on "humane" farms, mutilations like burning off chicks' beak tips and calves' horn buds, cutting notches out of pigs' ears, and castration without pain relief are routine. In the 10 years since Whole Foods' announcement of what, at the time, were novel animal welfare standards, most people have become aware of the numerous, horrifying eyewitness exposés of U.S. farms and slaughterhouses. As The New York Times put it, "In a country that lavishes love and legal protections on house pets, factory-farmed animals are left out in the cold." Laws usually go unenforced, company policies are frequently toothless and the public's ability to determine how animals are actually treated is limited by corporate and government collusion. Ultimately, there is no way around the violence inherent in an industry based on raising animals for the sole purpose of killing them for food. Most of the public condemns factory farming and believes that animals should be protected from suffering and harm. But even as concern for animals has risen, we have seen animal welfare standards becoming a marketing scam. In their zeal to advertise meat, milk and eggs as "humane," corporations engage in "humane-washing." Whole Foods is the starkest example of this failure. The past year has seen repeated investigations into what takes place on the farms that carry Whole Foods' "humane" labels. In September, PETA released an exposé of a pig farm that met Step 2 of Whole Foods' 5-Step standards-placing it well above the majority of Whole Foods' pork suppliers. The investigation found pigs crammed into dark sheds and denied veterinary care for debilitating infections, as well as the predictable animal abuse by workers who do the difficult work of raising suffering animals for profit. After uncovering these abuses, PETA filed a lawsuit over Whole Foods' deceptive marketing and the nonexistent enforcement of its animal welfare standards. The animal rights network Direct Action Everywhere (DxE) has also recently released investigations into Whole Foods, the first at a "Certified Humane," cage-free egg supplier and the second at one of only three businesses to have achieved a 5+ rating, the highest possible standard that a farm can achieve. 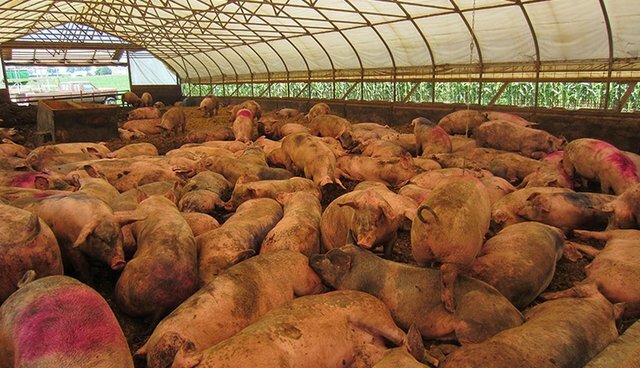 In the latter investigation, activists discovered that a sham farm was being used to market products from a farm that had conditions just slightly less horrific than those on a standard factory farm. As part of their investigations, DxE removed from the facilities a small number of animals who were in desperate need of veterinary care. In one of the videos of these animals, we see a turkey, named Sarah by the activists, voraciously devouring kale and playing with her sister. In every way, Sarah is just as complex an individual as the dogs and cats whom so many of us consider members of our families. Yet to Whole Foods, Sarah remains a product to be manipulated and sold. So long as animals remain property for companies to sell and shoppers to buy, they will continue to be victims of violence. PETA's mission has always been clear: Animals are not ours to eat, wear, experiment on, use for entertainment or abuse in any other way. We have not been purists, however, but pragmatists, recognizing that reducing suffering along the way to animal rights is a step toward that goal, and we have applauded many genuine reforms. But when animal welfare becomes a marketing ploy to increase corporate profits, rather than a way to lessen the suffering of animals, we will speak out. So today, PETA joins our fellow animal rights organizations in making it clear that, if Whole Foods-or any company-wishes to be decent to animals, it must stop the fraudulent advertising. "Humane meat" sounds nice, but it's still murder, and the only way to end such violence against animals is by promoting animal-friendly, vegan foods.